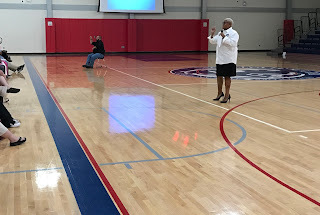 Dr. Tiffany W. Franklin served as the guest speaker for Lee High School's Parent Meeting on Sept. 27. Baton Rouge, La. – Southern University Land-Grant Campus Project Coordinator, Dr. Tiffany W. Franklin, served as the guest speaker for Lee High School’s Parent Meeting on September 27. Dr. Franklin was invited to the meeting by the school’s counselor, Ms. Keana Mason. The audience included the school’s freshmen and sophomore students and their parents. Franklin’s presentation was titled, “Bridging the Gap between Parents, Students, and Teachers: A New Age Learning Curve.” Her focus for the presentation was to introduce parents, students and teachers to information that would create an open dialogue for effective communication between all involved and encouraged parents to not be afraid to address real-life or complicated issues or situations when involving their children at school. During the presentation, Dr. Franklin provided both the parents and students with tips to assist them with a better educational experience. These tips encouraged parents to get informed and/or educated about what’s happening at their child’s school; be responsive to teacher’s concerns about their child’s academics, behavior, etc. ; and ask questions and get clarification when needed. SU Land-Grant Campus Parent Educator, Milissia John-Baptiste, also attended the presentation and suggested that parents develop a list of questions prior to attending any conferences or meetings at the school. This provides parents with time to think about the situation and process the reason for the gathering. Franklin and Batiste also set-up a table display where they shared information about the campus’ Recruitment Extravaganza, the Cooperative Extension program and the SU College of Agricultural, Family and Consumer Sciences with participants and school counselors. Baton Rouge, La. 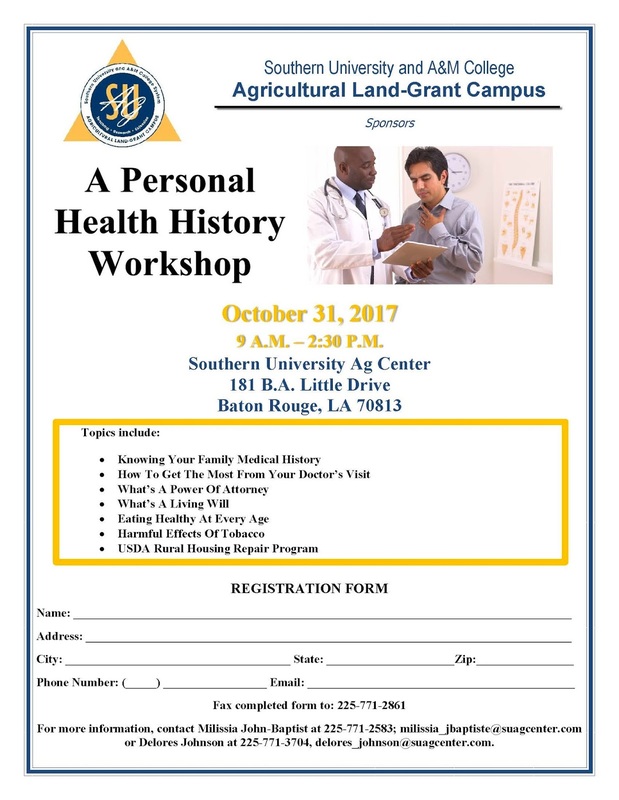 – The Southern University Agricultural Land-Grant Campus’ Family and Human Development Unit will host a ‘Personal Health History’ Workshop on October 31, 2017 at the SU Ag Center, 181 B.A. Little Drive, from 9 a.m. – 2:30 p.m. 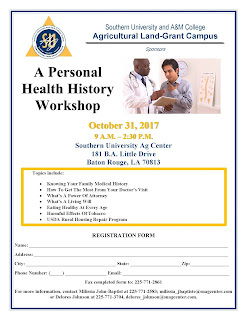 The free workshop will show individuals how to create a personal health history journal that can be used to keep track of not only their health history, but also the health history of their family’s including illnesses, medications, treatments and any past medical procedures. This information is often asked for by medical professionals when being admitted to the emergency room or seeing a doctor for the first time. To request a registration form or to pre-register, email milissia_jbaptiste@suagcenter.com, delores_johnson@suagcenter.com or call 225-771-2583, 225-771-3704. The deadline to pre-register is October 18, 2017. The Southern University Ag Center and the Southern University College of Agricultural, Family and Consumer Sciences together are called the Southern University Agricultural Land-Grant Campus. Dr. O.E. Ben Lukongo speaks to St. Landry Parish residents during a Sept. 19 focus group meeting at SARDI in Opelousas, La. The event was held to find ways to support economic development within the parish. Baton Rouge, La. 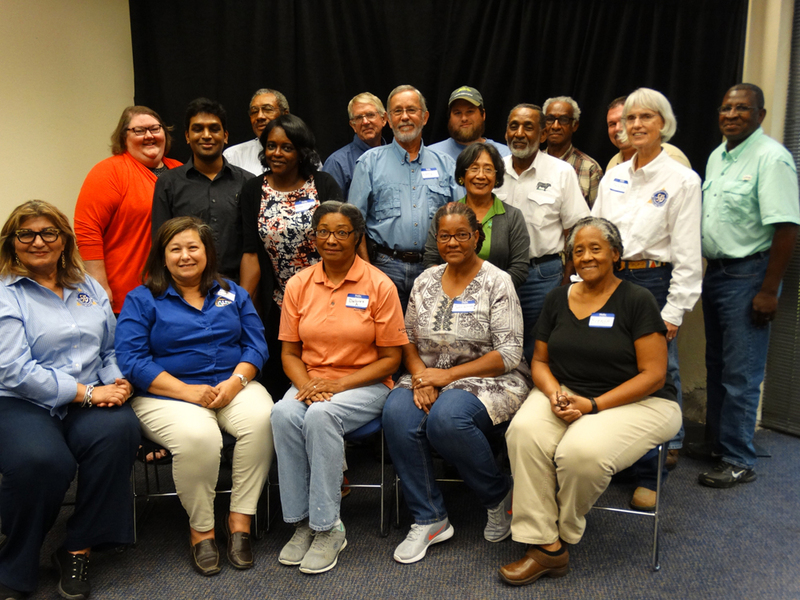 – The Southern University Land-Grant Campus (SULGC) hosted a community focus group at the Sustainable Agriculture and Rural Development Institute (SARDI) office in Opelousas, La. on September 19, 2017. The event was held to uncover a range of ideas, insights, and solutions to support economic development in St. Landry Parish. This new community engagement project was developed to improve the quality of life for parish residents and strengthen the relationship of the Land-Grant Campus with stakeholders within the community. Stakeholders within the parish participated in the focus group to share ideas, stories, experiences, and input; while discussing and co-creating the future vision for the community. Participants began by collectively answering questions on a focus group questionnaire titled, “Integrating Methods of Economic Development Analyses for Economically Distressed Communities in Louisiana.” After completing the questionnaire, the participants were then separated into four smaller groups and collaborated with university representatives to discuss ways to improve the community, identify issues, and discuss alternative solutions, plans, resources and assets needed to better the community. 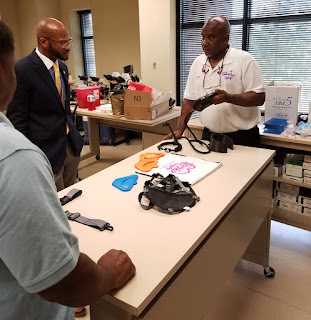 The focus group was comprised of elected officials, clergy, teachers (current and retired), medical professionals, youth, and others who serve the community in various capacities. SARDI’s office serves as the headquarters for this new framework of University-Community Engagement. The planning of the focus group discussion was arranged by Dr. O.E. Ben Lukongo, Project Director; Dr. Tiffany Wilkerson-Franklin, Co-Project Director; Dr. Kenyetta Nelson-Smith, Co-Project Director; Antonio Harris, Director of SARDI and SARDI’s staff. The SULGC research team will go back to present the results of the focus group discussions to the St. Landry Parish economic development stakeholders. For additional information on how you can assist in the implementation and execution of future focus groups, please contact Drs. Lukongo, Wilkerson-Franklin or Nelson-Smith at 225-771-2242. 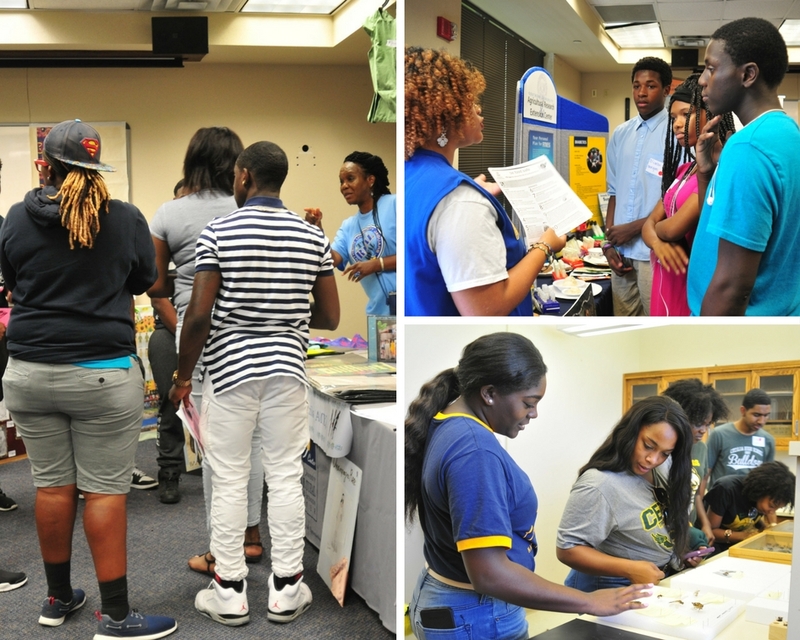 Photos from the 2017 Southern University Agricultural Land-Grant Campus Recruitment Extravaganza held on September 30, 2017 at the SU Ag Center. Baton Rouge, La. – More than 200 high school students, parents and chaperones - representing over 30 high schools from through the state - attended the Southern University Agricultural Land-Grant Campus’ first Recruitment Extravaganza. The event was held at the SU Ag Center on Saturday, Sept. 30 from noon to 5 p.m.
During the extravaganza, high school students were able to visit booths and discuss the career opportunities available in the fields of agricultural sciences, family and consumer sciences and urban forestry and natural resources with professors and college students majoring in agriculture. The Recruitment Extravaganza also featured livestock, biofuel production, and drone demonstrations. 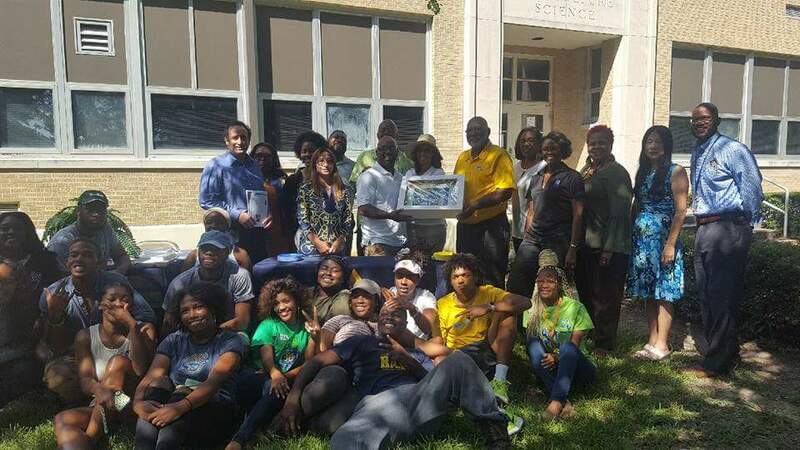 More than $20,000 of financial assistance, in the form of book stipends or research and extension assistantships, was pledged to select, qualifying students who committed to enrolling at Southern University in the Fall of 2018 and selecting a program of study in either agricultural sciences, family and consumer sciences, or urban forestry and natural resources. 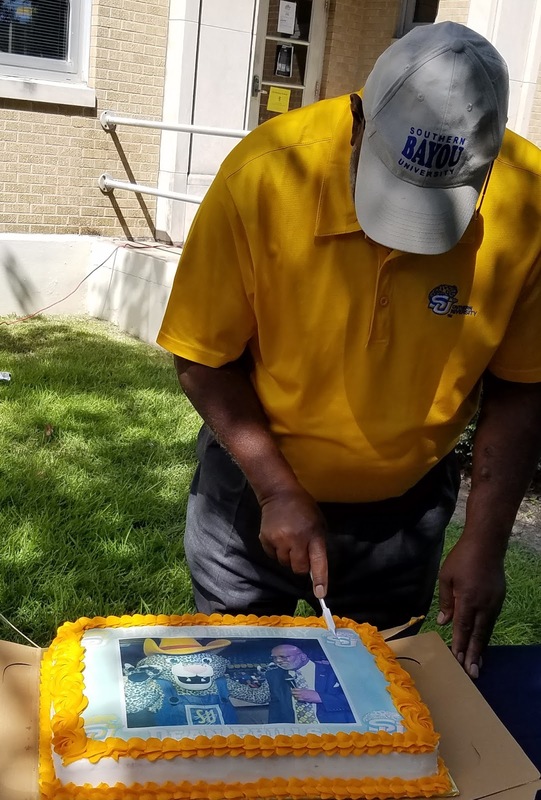 Participants were also treated to a tailgate where they were greeted by Southern University System President – Chancellor Dr. Ray Belton. 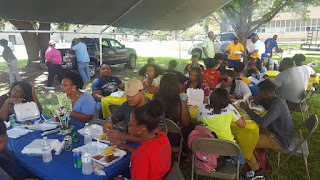 Everyone who participated in the extravaganza also attended the Southern University Jaguars vs. the Fort Valley State University Wildcats football game in A.W. Mumford Stadium. The Southern University Agricultural Land-Grant Campus will continue to hold additional recruitment activities to expose more elementary, middle and high school students to the career opportunities available in the field of Agriculture. 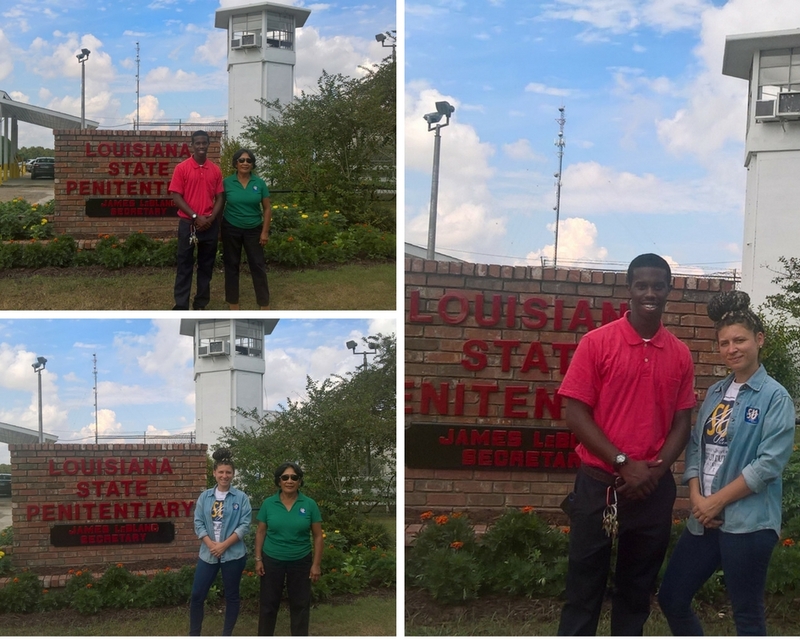 SU Land-Grant Campus employees Mila Berhane and Stephanie Elwood pose with Delane Ross outside the Angola State Penitentiary. Ross invited Berhane and Elwood to speak to his agricultural sciences students. Baton Rouge, La. – Southern University Agricultural Land-Grant Campus Senior Research Associate, Mila Berhane and Extension Associate, Stephanie Elwood, held a lecture at Angola State Penitentiary on Sept. 20. 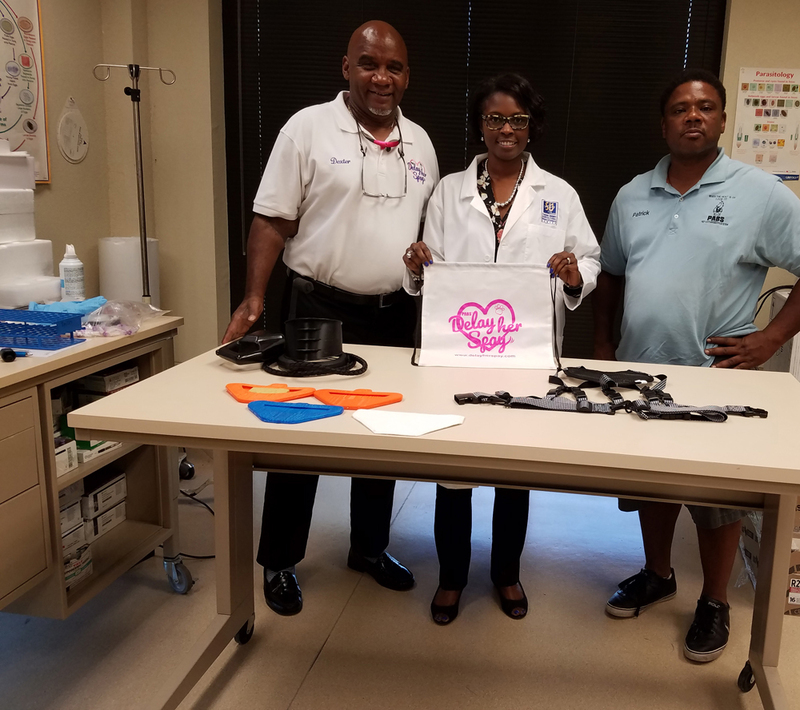 The two were invited to speak to nearly 40 agricultural sciences students by Delane Ross with the Baton Rouge Community College’s Louisiana Federal Prison Program. During the presentation, Elwood spoke about her experience working with incarcerated youth while Berhane spoke about non-traditional uses of traditional crops. After the lecture, Berhane and Elwood were provided with a tour of the facilities trade school. The SU Land-Grant Campus will continue to partner with other educational institutions and agencies in an effort to provide opportunities to the incarcerated community. The breast cancer awareness event will be held on October 19, 2017, on Southern University’s Baton Rouge campus. Onsite registration will be held from 5 p.m. until 6:30 p.m. at the SU Ag Center. Proceeds from this fundraiser will be donated to Pink Party Recipient, Marcia Myles, who is currently undergoing chemotherapy treatment. 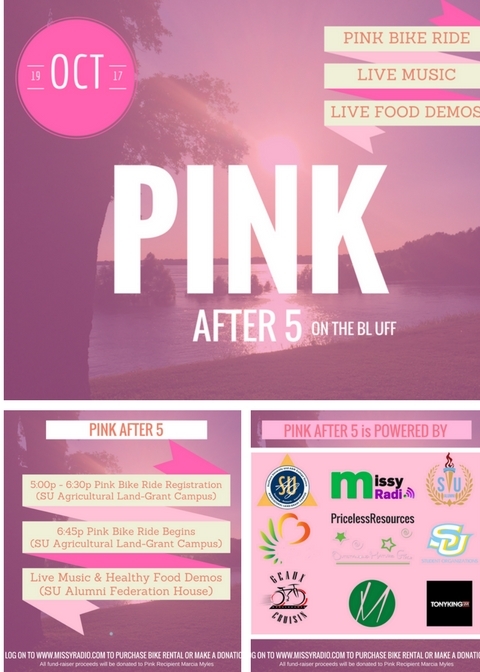 The Pink Bike Ride will begin at the Southern University Ag Campus, ending at the Southern University Alumni Federation House with live music, healthy eating, and fun. Tickets range from $0 - $25. The entire family will have an opportunity to join a cause that raises awareness to millions around the U.S. during the month of October. Pink Bike Riders can pre-register, get tickets, or make a donation at https://goo.gl/Bc2Xaw. The Pink Party with a Purpose began in 2006, when local radio personalities Missy and Sashika joined forces to raise awareness to young women about breast cancer after Missy’s hairstylist, Jacinta Freeman, was diagnosed with cancer at the age of 28. Freeman had to abruptly stop working to undergo a mastectomy and chemotherapy, which caused her to lose a portion of her primary source of income. As a result both Missy and Sashika put on their creative wigs and gave birth to, “The Pink Party with a Purpose.” For the past ten years, ten ladies have received an outpouring of love from the community during their time of need. The Missy Radio Organization is a ten year champion in bringing awareness to breast cancer in young women. 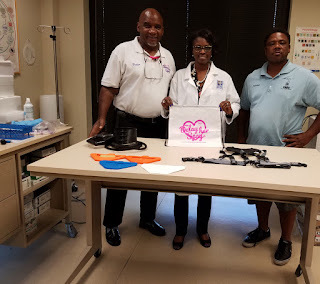 The organization consist of a network of individuals and other organizations dedicated to facilitating communications and education to improve communities in Louisiana. The organization aims to facilitate community expression; provide access to interactive media for the purpose of sharing news, music, culture, and information; and the production of unique and diverse programming that challenges the cultural and intellectual assumption of its core audience with a respect for all peoples and a concern for those under-represented by other media. For additional information, contact SU Ag Center Assistant Area Agent Nicolette Gordon at 225-222-4136. Baton Rouge, La (September 28, 2017) – On September 12, the Agricultural Sciences Department held a student round-up for all College of Agricultural Family and Consumer Sciences faculty, staff, and students. This is an event the Ag Science department plans every year at the beginning of the semester to get students geared up for the semester. It also allows students the opportunity to mingle with faculty and staff. It was a great turn out and Dr. Bobby R. Phills, Chancellor-Dean of the SU Ag Center-CAFCS was surprised with a birthday cake. The event was sponsored by Four Paws Pet Cremation Service, created by SU alum to serve the needs of veterinary clinics and their clients. Baton Rouge, La. (September 28, 2017) - The Southern Institute for One Health, One Medicine (SIOHOM) is an institute that serves as an umbrella organization that promotes interdisciplinary research, teaching, and outreach/extension to improve the lives of all species—animal, human, and plants. One of the goals is to develop and transfer enhanced health system technologies, with impacts at local, state, regional, national, and international levels. On September 11, 2017, the institute hosted Highly Favored Creations, a Shreveport-based company that specializes in pet products. The CEO, Dexter Blanche, brought prototypes for two new inventions for pets. One is a pet anti-breeding device (PABS) and another is a dog leash and collar that delivers water to the dog while walking. SIOHOM is in the process of assisting Highly Favored Creations with Phase 1 trials of their new sterile urine collection system. 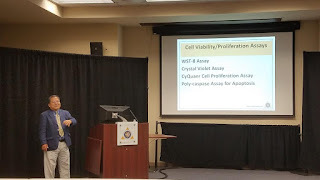 The group also spoke to the Reproductive Physiology class about entrepreneurship and some possible collaborative opportunities on future inventions of animal technology. For more information, contact Renita W. Marshall, DVM, Veterinarian, Professor, Animal Science, Chair, Agricultural Sciences, and Director, Southern Institute for One Health, One Medicine via email at renita_marshall@suagcenter.com. 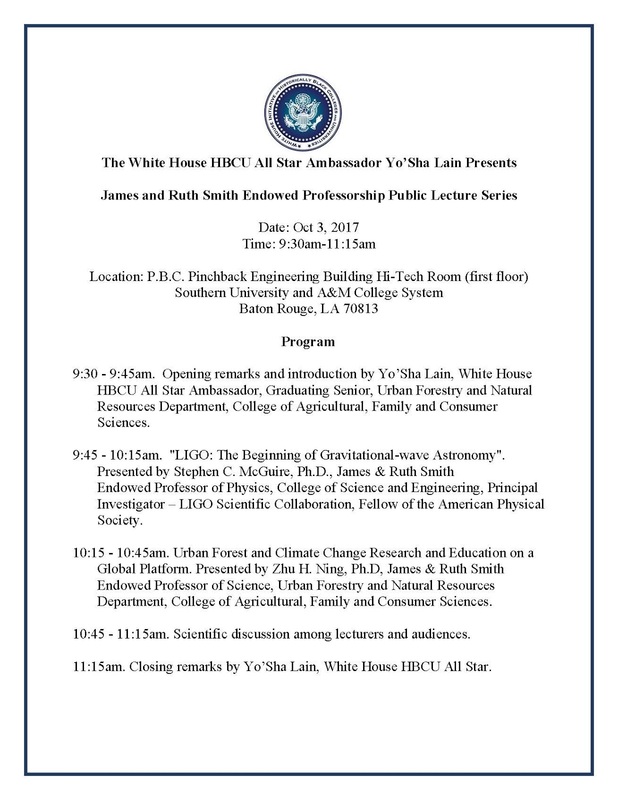 Baton Rouge, La (September 28, 2017) – The SU White House HBCU All-Star Ambassador Yo’Sha Lain is set to present at the James and Ruth Smith Endowed Professorship Public Lecture Series on Oct. 3, at 9:30 am -11:15 am in the Hi-Tech Room (first floor) of P.B.C. Pinchback Engineering Building, Southern University in Baton Rouge, LA. 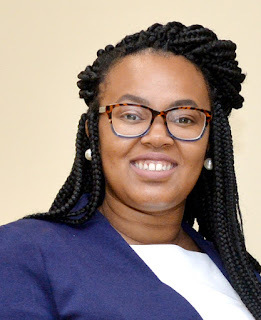 Ms. Yo’Sha Lain is an Urban Forestry and Natural Resources Graduating Senior in the College of Agricultural, Family and Consumer Sciences, part of the SU Agricultural Land-Grant Campus. 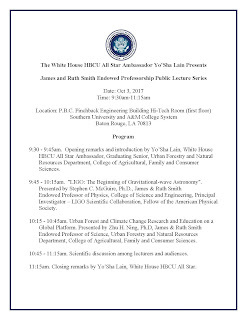 Zhu H. Ning, Ph.D., James & Ruth Smith Endowed Professor of Science, Urban Forestry and Natural Resources Department, College of Agricultural, Family and Consumer Sciences serves as Ms. Lain’s academic advisor and her White House HBCU All-Star Campus Based Mentor. For additional information, contact Dr. Zhu Ning at zhu_ning@subr.edu or call (225) 771- 6292. Dr. Kit Chin, Director of Roselle Hibiscus Research at the SU Land-Grant Campus, discussed the effects of roselle hibiscus and wild-collected mushrooms on the growth of human cancer cells on Sept. 26 at the SU Ag Center. Baton Rouge, La. – The Southern University Agricultural Land-Grant Campus (LGC) kicked off its Fall Seminar Series on September 26 with a presentation on medicinal plants. The presentation, which focused on roselle hibiscus and wild mushrooms, was presented by Dr. Kit L. Chin, Director of Roselle Hibiscus Research at the LGC. During the seminar, Dr. Chin discussed the role that hibiscus plants and wild mushrooms play on the inhibition of human cancer cell growth. He also discussed the effects of extracts of the color pigment profile from the hibiscus plant and wild-collected mushrooms on human cancer cell growth. The next scheduled seminar will be held on October 26 with SU College of Agricultural, Family and Consumer Sciences alumnus Dr. LaPorchia Collins. Dr. Collins will present on her successful journey since Southern University. Dr. James Hanson, Professor of Agronomy and Statistician for the LCG, will also present a seminar on “Experimental Plan and Design” on November 16. Both seminars will be held at 3 p.m. in the SU Ag Center. 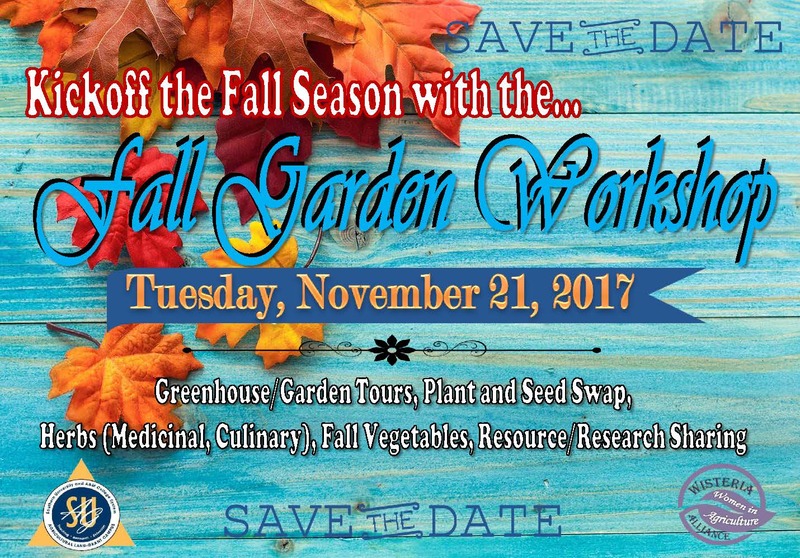 Baton Rouge, La (September 27, 2017) – The SU Agricultural Land-Grant Campus will kick off the fall season with a garden workshop on November 21. 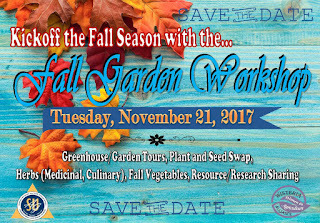 Participants will learn about fall vegetables and enjoy garden tours. Full details will follow. Baton Rouge, La (September 25, 2017) – Today, 12 farmers who grow and sell vegetables and fruits attended a produce safety training hosted by the SU Land-Grant Campus. 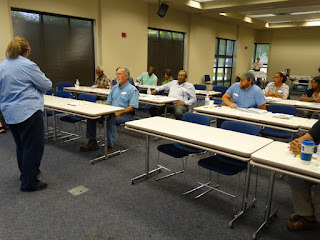 The farmers learned about the Produce Safety Rules and exemptions as delineated by the Food Safety Modernization Act. They also learned about worker health, hygiene, and training; soil amendments; wildlife, domesticated animals, and land use; agricultural water; post-harvest handling and sanitation; and how to develop a farm food safety plan. The purpose of the training is to make our food safer by preventing problems that result in foodborne illness, rather than dealing with problems after they happen. The project is funded by the Food and Drug Administration (FDA). 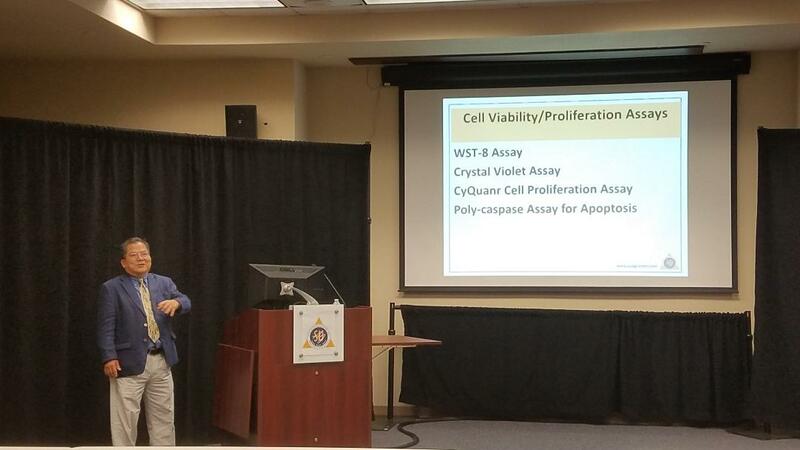 The course was taught by Fatemeh Malekian, PhD, Produce Safety Project Director; Audrey Carrier, La. Dept. of Agriculture & Forestry; Mila Berhane, Senior Research Associate; Burnell Muse, extension specialist, St. Helena Parish; Kranti Yemmireddy, LSU AgCenter; Allison Dumas, La Dept. of Agriculture & Forestry. The session was coordinated by Emily King, Produce Safety Program Coordinator. Photo by Chris Rogers, SU Ag Center. Baton Rouge, La. – Southern University has selected Lafayette based Advanced Biomedics, LLC as the University’s medical marijuana cultivation and production facility operator. The decision was voted on by the University’s Board of Supervisors during its Sept. 22 board meeting. "Today the Board has voted to affirm the work invested by the Ag Center and the Medical Marijuana Review Committee to select a vendor for our historic medical marijuana initiative. We are excited about the opportunity to enter into this venture that has the potential to bring health benefits to improve lives and also to build into a successful enterprise for Southern University," said Ann. A. Smith, Chair of the SU Board of Supervisors. Advanced Biomedics, LLC will produce pharmaceutical grade medicines from marijuana plants, under Southern University’s license, for patients suffering from Cancer, HIV/AIDS, cachexia or wasting syndrome, seizure disorders, epilepsy, spasticity, Crohn's disease, muscular dystrophy and multiple sclerosis. “This is a great day for Southern University and HBCUs across the country,” said Dr. Bobby R. Phills, Chancellor-Dean of the Southern University Ag Center and College of Agriculture. The University’s evaluation committee has worked closely with the Louisiana Department of Agriculture and Forestry, the Louisiana Board of Pharmacy and the Louisiana State Board of Medical Examiners throughout the process. Stringent guidelines for doctors to recommend the medication has been developed by the Louisiana Board of Medical Examiners. The medication will be provided to patients in the form of oils, pills, powders, gelatin-based chewables and other non-inhalable forms. Under the proposed agreement, the Southern University Ag Center will receive more than $6 million over 5 years. Advanced Biomedics, LLC will also support research initiatives through the Southern University Ag Center’s Southern Institute of Medicinal Plants (SIMP). “The research conducted at SIMP will focus on enhancing the knowledge base of plants and their potential of therapeutic effects and medical uses on human health,” said Dr. Janana Snowden, Director of SIMP. No taxpayer dollars will be spent on the program. For additional information about Southern University’s Medical Marijuana Program visit, http://www.suagcenter.com/PageDisplay.asp?p1=12549. 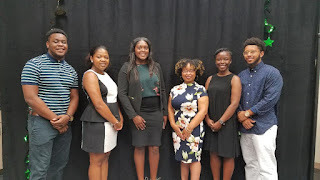 SU Urban Forestry Club members pictured from left to right: Jordan Davis, Treasurer; Briana Carter, Historian; Chyanna McGee, President; Asija Rice, Vice President; RaLisa Smith, Secretary and D'Michael Lucas, Sergeant-at-arms. The Urban Forestry Club held their first annual "Meet and Greet" for Urban Forestry students and professors on Sept. 15 at the SU Ag Center. 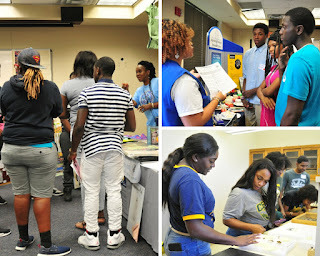 The event was held to introduce the Urban Forestry students to the department's faculty members. "This is one of several events that we will implement to connect our students and faculty members," said Dr. Andra Johnson, Vice Chancellor for Research at the SU Ag Center. The brunch was organized and facilitated by the student members of the Southern University Urban Forestry Club. 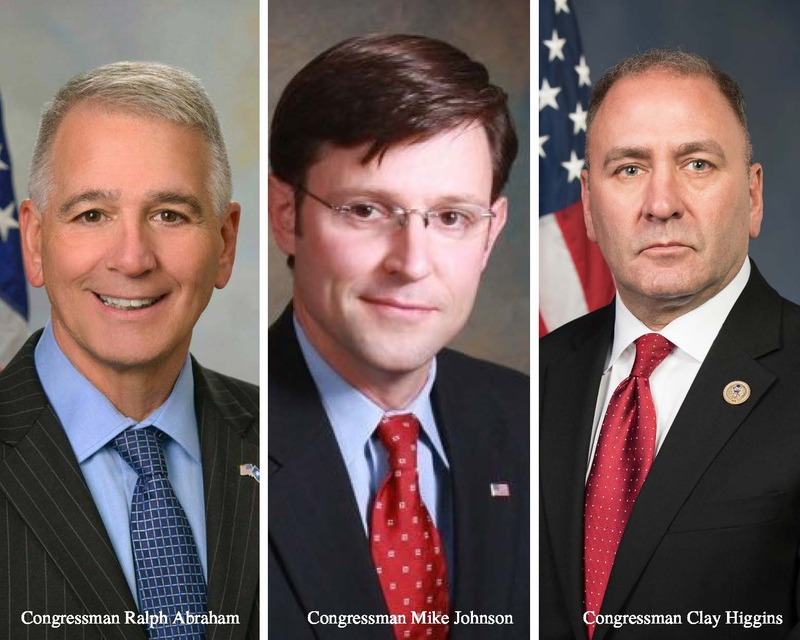 The offices of the three Congressmen elected to represent St. Landry Parish will attend the 'Farmers and Agriculture Stakeholders Forum' hosted by SARDI on Sept. 13 in Opelousas, La. Baton Rouge, La. – The Sustainable Agriculture and Rural Development Institute (SARDI) will host a “Farmers and Agriculture Stakeholders Forum” on Wednesday, September 13th at 1:30 p.m. in SARDI’s office, 1209 Diesi St., in Opelousas, La. Farmers, agricultural stakeholders, elected officials and community stakeholders are invited to participate in the forum. Participants will be provided with information on programs and services offered by the federal government; as well as helpful resources for farmers and agricultural workers who have been impacted by the 2016 floods and Hurricane Harvey. A representative from the USDA and the offices of the three Congressmen elected to represent St. Landry Parish - Congressman Ralph Abraham, Congressman Clay Higgins and Congressman Mike Johnson - will be in attendance to present information and address questions. o Subcommittee on Water, Power, and Oceans. Interested participants are asked to pre-register by Monday, September 11th to SARDI@suagcenter.com or by calling Krystle J. Washington at 337- 943-2410. Research has shown that every major crop grown in the state, is grown in St. Landry Parish; and, for decades the parish has been a leading agricultural parish in the state. A pillar of the mission at SARDI is to provide local farmers/ agriculture stakeholders with the information, tools, and resources they may need to go to the next level. SARDI is a satellite campus of the Southern University Agricultural Research and Extension Center located in Opelousas, La. in St. Landry Parish. Baton Rouge, La. 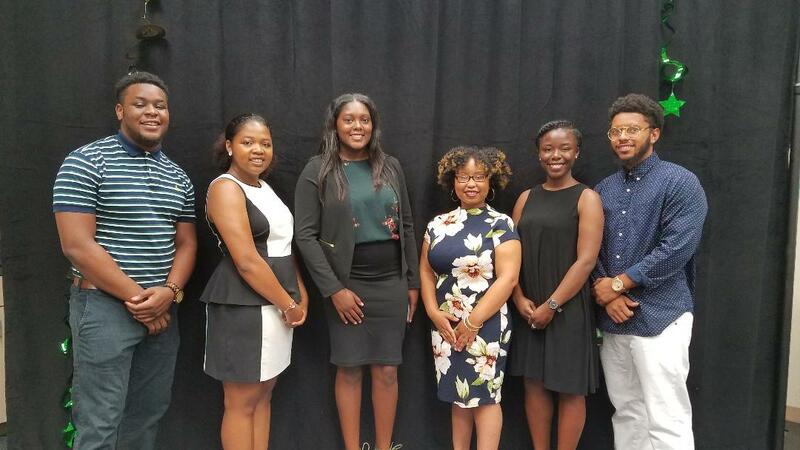 – Dr. Tiffany Franklin, 4-H Citizenship Washington Focus (CWF) Coordinator at the Southern University Land-Grant Campus, and Ms. Tara Hollins, accompanied a delegation of six youth to the 2017 CWF in Washington D.C., July 10 -14. One of the CWF participants Michael Wicker, a student at the Southern University Laboratory School, filmed and edited a video as part of a national competition for the program. The concept of the video was to reduce underage drinking and teen smoking among youth in his community. The video can be viewed on YouTube here. Citizenship Washington Focus is an educational conference for youth ages 15 to 19. The program is hosted at the National 4-H Center near Washington, D.C. and provides youth the opportunity to explore, develop, and refine the civic engagement skills they need in order to become outstanding leaders. The youth delegates get a behind-the-scenes look at the nation’s capital while meeting with members of Congress to learn more about how government works. At the end of the program, youth draft step-by-step action plans to address important issues in their communities. The youth have developed a plan that will provide a hands-on, engaging seminar with other community youth, while discussing the negative effects of underage drinking and smoking. Other delegates participating in the 2017 CWF program were Michael Boudreaux and Tyliya Pitts, from the SU Lab School, along with Jaymya Jouber, A'mya Thomas, and Coby Pittman, from Park Ridge Academic Magnet School.